Terrifying! More than 7,000 underground methane gas bubbles are about to explode in the Arctic! Experts believe the ‘bubbles’ will erupt causing more large craters that have been noticed in recent years in Arctic regions of Siberia. 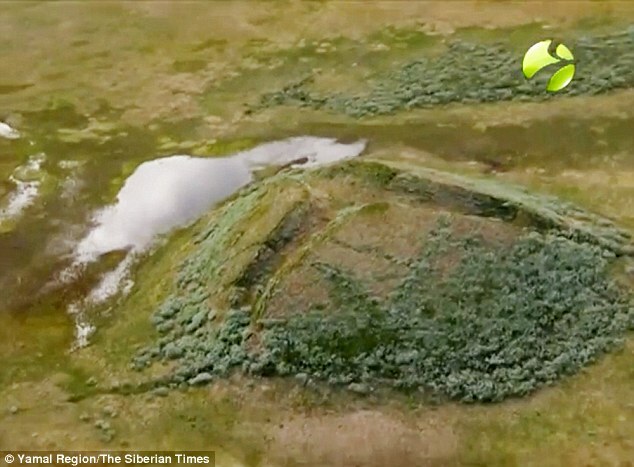 Alexey Titovsky, director of Yamal department for science and innovation, said that the methane gas bubbles are contained within pingos, dome-shaped mounds consisting of a layer of soil over a large core of ice found in permafrost areas. ‘At first such a bump is a bubble,’ he said. The figure of 7,000 gas-filled mounds is ‘startlingly more than previously known’, reported The Siberian Times. A number of explosions in recent years has led to the formation of spectacular new craters or funnels. WHAT HAPPENS IF THE BUBBLES EXPLODE? Yamal is Russia’s main area for extracting natural gas, and there are fears that explosions could lead to damage to key energy facilities. When the bubbles explode they release methane gas which is approximately 84 times more potent than carbon dioxide. After they’ve exploded they leave gigantic funnels or craters. The extent of the harmful greenhouse gases buried in this new phenomenon of jelly-like bubbles poses ‘very serious alarm’ concerning the impact of global warming, experts have warned.